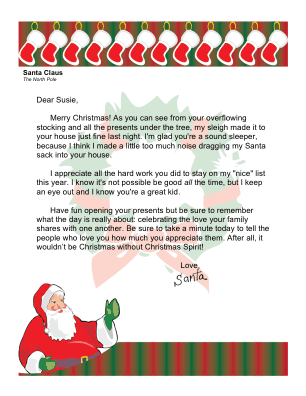 This printable letter from Santa reminds children to appreciate the love of family at Christmastime, not just gifts. Merry Christmas! As you can see from your overflowing stocking and all the presents under the tree, my sleigh made it to your house just fine last night. I'm glad you're a sound sleeper, because I think I made a little too much noise dragging my Santa sack into your house. I appreciate all the hard work you did to stay on my "nice" list this year. I know it's not possible be good all the time, but I keep an eye out and I know you're a great kid. Have fun opening your presents but be sure to remember what the day is really about: celebrating the love your family shares with one another. Be sure to take a minute today to tell the people who love you how much you appreciate them. After all, it wouldn't be Christmas without Christmas Spirit!